Above: The New Horizons flyby of Pluto, revealing a strange new world to us - and this is just the first of New Horizon's targets... Courtesy of NASA. Aboive: The 'halo craters' of Pluto. It's an entirely new world, never seen before, so there's lots to get scientists scratching their heads. But right away something leapt out as odd in a different way - because of its very familiarity: Pluto has what looks a hell of a lot like glaciers. In case you don't pay a lot of attention to geology, glaciers a flows of ice that wind their way across very cold landscapes. For glaciers to flow - on Earth at least - a certain amount of the ice must be warm enough to contain a small amount of water. Above: A terrestrial glacier, spilling out onto a tundra plain. On Pluto all the water ice is deep, deep, frozen - as hard as rock. So for these glaciers to show the signs of flow they have they must be made of something with a far, far lower freezing point - and the most likely candidate is nitrogen, the gas that makes up most of our (and Pluto's) atmosphere. Above: Glacier-like landscapes on Pluto that seem to flow - at temperatures far, far, to low for water ice to move at all. Here one is caught slowly flowing in to fill a crater in a huge, slow motion, flood. Courtesy of NASA. As the seasons change on Pluto the type of ice that is most stable changes. The nitrogen ice will always seek out the most stable form so... well imagine the explosive reaction that happened in the video happening all across a massive glacier. 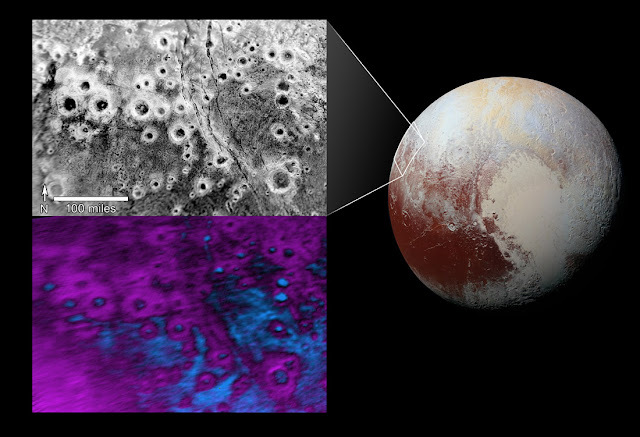 I have no idea what the glacier would do, but at least the images of Pluto don't look like the dwarf planet exploded. These glaciers might be a hint at more than just alien physical processes and chemical reactions. It could be a hint of a habitat for Plutonian life. Y'see, if these glaciers are made of frozen nitrogen, and flow like glaciers on Earth, then thirty meters or so beneath the surface they are probably riddled with veins of liquid nitrogen. Recently, computer simulations have shown that cell membrane-like structures could exist in the frigid liquid methane seas of Titan, and it's been known for a while that there's something on Titan is consuming hydrogen and acetylene. So is it much of stretch to imagine some Plutonian equivalent to life operating in subsurface pockets of liquid nitrogen? Many microbes live beneath the surface of Earth's glaciers - although that's not really a fair comparison. Still, while it's a far fetched idea, it was suggested a long time ago that liquid nitrogen chemistry might support life based on silicon instead of carbon. If that's a bit much of a stretch (and I'll admit I've been more imaginative than scientific with it) a more prosaic line of though suggests there might be a habitable zone beneath Pluto's surface: Pluto is loosing its nitrogen atmosphere at a rate of 500 tons per second... yet it still has an atmosphere. That suggests some sort of internal activity is replenishing it, and internal activity might well mean enough heat to keep a subsurface ocean, like Jupiter's moon Europa. Worlds on the edge of knowledge: Triton.